Since the United Nations Framework Convention on Climate Change – UNFCCC – was adopted in 1992, the 197 Contracting Parties have met annually to discuss what can be done to reduce global warming. COP stands for “Conference of the Parties” and COP22 in Marrakech is the twenty-second in the succession of such gatherings. The Paris Agreement, adopted by COP21 last year, entered into force in November this year, breaking the speed record for an international environmental agreement. Given all the attention the Paris Agreement has attracted, it looked almost as if the Agreement itself was the objective. That is obviously wrong. The Paris Agreement is only the starting point. Nobody came to Marrakech to celebrate. See also: Trump and climate change – an unmitigated disaster? The Kyoto Protocol was adopted at COP3 in 1997. It contains legally binding emissions targets. In the first commitment period, from 2008 to 2012, thirty-seven industrialized countries and the European Union undertook obligations. Norway met its obligations by purchasing carbon credits, not by reducing its own emissions. We are now halfway through the second period, which runs from 2013 to 2020. Several key countries have withdrawn, including the US, Russia and Japan. First, many more states are committed under the Paris Agreement. At the time of writing, over one hundred states have joined, and more are expected. This is much better than the Kyoto Protocol’s thirty-seven states. The second difference is that the State Parties to the Paris Agreement decide individually the size of their emissions cuts – no centrally determined caps are forced down the countries’ throats. While they are obliged to set as ambitious emission targets as possible, governments are likely to set their individual caps far too low (given the targets reported so far, we’re heading for a warmer planet by three degrees!). The third difference is that the Paris Agreement has no sanctions it can invoke in the event of violations. In other words, the only consequence of failing to achieve targets will be political and symbolic. Which again means that under the Paris Agreement the planet is likely to grow warmer by more than three degrees. The fact that the Paris Agreement has entered into force does not, therefore, close the gap between words and deeds. 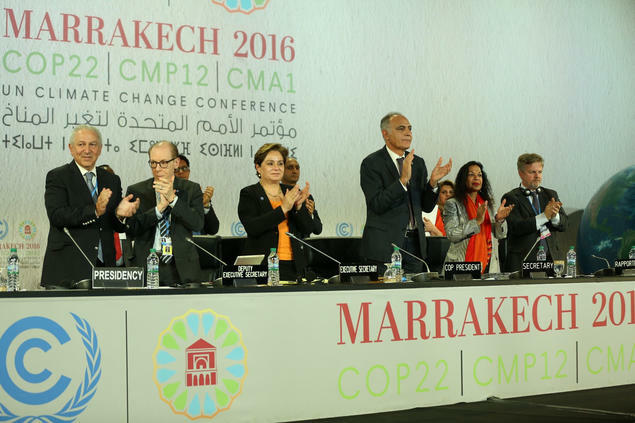 Many called COP22 in Marrakech “the COP of action” to emphasize the importance of actually making a start. When the Climate Change Convention was adopted in 1992, the world looked quite different from today. States were divided into two categories, developed and developing countries. In light of the history of greenhouse emissions, the developed countries were expected to take the lead and do most of the heavy lifting. This duel classification, however, has led to one of the deepest conflicts in the climate negotiations – one that persists to this day. Several of the states on the list of developing countries have since become economic powers in their own right, with significant greenhouse gas emissions. The industrialized parts of the world have been reluctant to cut emissions without their trade competitors doing the same. When China and the United States joined forces to ratify the Paris Agreement, it was an important signal of governmental willingness to cooperate in spite of this conflict. Many see the Paris Agreement as a step away from the traditional dichotomy. This is a rather over-optimistic interpretation. During the negotiations in Marrakech, the differentiation principle was still described by many as the cornerstone of the agreement. This means that the division of duties and responsibilities will continue to represent one of the major challenges in the future. How the Paris Agreement will be implemented in practice remains to be sorted out. The biggest bones of contention are how mitigation should be financed, the level of ambition states should adopt, what role allowances will play, and, not to forget, how to deal with losses and damage resulting from climate change. Although there is disagreement on many points, there is one thing they all agree on. The role of business and non-governmental organizations will be critical. The sanctions system is based on the principle of “naming and shaming”, and it is essential for civil society to get involved. Its job will be to persuade national leaders to set ambitious targets and to monitor performance. Transparency and public participation in decision-making are therefore crucial ingredients in the fight against global warming. The joker in the pack is, of course, what climate change denier Donald Trump will do when he takes office as the next president of the United States. The US, Trump has famously announced, will withdraw from the widely acclaimed Paris Agreement, and will also try to reverse a number of mitigation programmes at home. But if the United States were to withdraw from the Paris Agreement or from the Climate Change Convention, it would not necessarily be the end of international collaboration on climate change. Diplomacy will continue, even without the United States. The greatest danger is that other states may follow suite and decide to withdraw. But although Trump is a climate change denier, the IPCC reports will still be the basis for decisions for the remaining negotiating parties. They are many, and there is broad consensus and commitment to finding a common solution. The only thing now is to translate words into action.